Situated on the southern part of Hong Kong, Repulse Bay is the most attractive bay area to be found on the island. Once the scene of a battle between the British Empire and pirates, today is it a prosperous residential area that features relaxation, dining and aquatic activities. Though being an excellent escape from the hustle and bustle of the urban nature of Hong Kong, the city’s skyscrapers can still be seen from here. Repulse Bay is a visual treat that combines the beauty of nature with that of the urban heart of the city. When standing at the coolness of the beach the visitors will be privy to a collage of skyscrapers, sand and dominating mountainside that forms a canvass for the entire image. The crescent shaped beach on Repulse Bay is magnificent, featuring clear blue waters and glistening yellow sand that is picturesque in nature. Swimming is an extremely popular activity here. 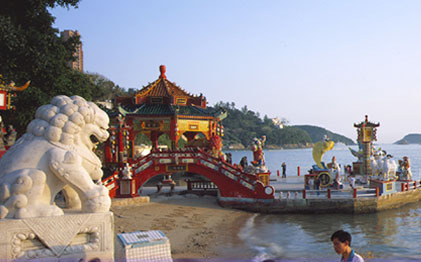 Going for a scenic stroll and sunbathing are two other activities regularly practiced on Repulse Bay. Another attraction that is found on the beach is the Lifeguard Club House that is constructed in a traditional Chinese architectural style. Highlights include the swirling dragons on the ceiling of the interior and the two statues of Kwan Yum and Tin Hau (protectors of fisherman). An old hotel that refurbished in to a shopping complex has been dubbed ‘The Repulse Bay’ offers visitors a range of restaurants and shopping options to indulge in. The original arcade that was constructed in 1920 still remains and is the ideal place for a romantic dinner for two under the stars. Further dining options can be found near ‘The Repulse Bay’ including numerous open air restaurants that specialize in barbequed food including squid, prawns and fish. Guests looking for a luxury hotel in Hong Kong will find The Langham Hong Kong an ideal accommodation option. Guests residing at this luxury Hong Kong hotel will be centrally situated providing convenient access to Repulse Bay and numerous other attractions.